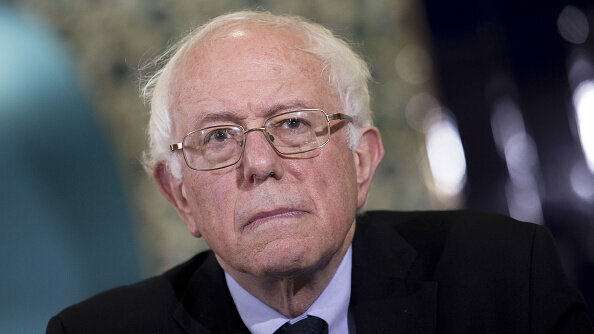 Bernie Sanders&apos; presidential campaign has been locked out of a key database of Democratic voter information after a staffer accessed data collected and organized by Hillary Clinton&apos;s campaign. The Democratic National Committee&apos;s decision to block the Sanders campaign from conducting basic and fundamental voter outreach comes at a critical moment in the presidential race. The information is needed to identify and contact voters, and to secure their support in upcoming caucuses and primaries. The Sanders campaign blasted the DNC at a press conference Friday, calling the decision to block the data an "inappropriate overreaction." The committee is "now actively attempting to undermine our campaign," campaign manager Jeff Weaver said. He added that "if the DNC continues to hold our data hostage," the campaign would be in federal court Friday afternoon "seeking immediate relief." "Clearly, while the information was made available to our campaign because of the incompetence of the vendor, it should not have been looked at, period," Weaver said. "Rather incredibly," he continued, "the leadership of the DNC has used this incident to shut down our ability to access our own information — information which is the lifeblood of this campaign." First an explanation of the data breach: Like its Republican counterpart, the DNC maintains a massive database containing information about voters across the country. Campaigns of all sizes, from presidential down to the local level, are granted access to this information, and use it to organize both big-picture strategy and day-to-day operations. All campaigns have access to the same basic set of information that states collect about voters: names, addresses, party identification and voting history. Campaigns add their own information about those voters — usually, information gathered from door-to-door canvassing and phone calls. They also use the data to conduct big-picture modeling about voters&apos; likely preferences for specific candidates and develop their overall strategy. That proprietary information is supposed to be secure from other campaigns. But on Wednesday, a software bug in the database allowed campaigns to see each other&apos;s private voter info. A spokesman for the Bernie Sanders campaign confirms a staff member accessed another campaign&apos;s information. "After discussion with the DNC it became clear that one of our staffers accessed some modeling data from another campaign," said Sanders communications director Michael Briggs. "That behavior is unacceptable, and that staffer was immediately fired." The DNC says Sanders&apos; campaign won&apos;t be able to access the voter database until the incident is fully explained and there&apos;s proof that any improperly accessed data has been disposed of. "Sadly, the vendor who runs the DNC&apos;s voter file program continues to make serious errors. On more than one occasion, the vendor has dropped the firewall between the data of different Democratic campaigns. Our campaign months ago alerted the DNC to the fact that campaign data was being made available to other campaigns. At that time our campaign did not run to the media, relying instead on assurances from the vendor. Sanders&apos; supporters are painting this as another instance of the party establishment working against Sanders and favoring his rival Clinton. The DNC was already under scrutiny for a debate schedule that left many wanting more; there&apos;s a debate scheduled for Saturday — one of the busiest shopping days of the year. The Clinton campaign has not commented on the incident. There&apos;s no question that being locked out of the voter files is a major short-term hurdle for the Sanders campaign. Ethan Roeder, who directed data operations for Barack Obama&apos;s 2008 and 2012 presidential campaigns, described the national database as "an online search tool that all of the campaign staff all across the country use to do voter contact." "All of the organization activity that happens on the ground level is managed through this platform," Roeder said. "When you make a phone call or knock on a door or have a conversation with a voter, the result of that goes straight into the [system]," Roeder said. "Not having access means there&apos;s nowhere to store your information. And there&apos;s nowhere to pull your information back out of." The DNC and NGP VAN are both pushing back on the suggestion that this breach was anything but an isolated incident. "This bug was a brief, isolated issue, and we are not aware of any previous reports of such data being inappropriately available," the company said in a blog post on its website. "We look forward to supporting all our Democratic clients, and in particular apologize to the DNC, Clinton and Sanders campaigns for our bug Wednesday. We will continue to work with and report to the DNC regarding this issue to ensure that this isolated incident does not recur. We have and will do better." The DNC says it has ordered an audit of the breach, what led to the failure and how widespread it was. "The DNC places a high priority on maintaining the security of our system and protecting the data on it," said DNC Communications Director Luis Miranda in a statement. "We are working with our campaigns and the vendor to have full clarity on the extent of the breach, ensure that this isolated incident does not happen again, and to enable our campaigns to continue engaging voters on the issues that matter most to them and their families."